There are currently 3,521 users on this website. Here is a long ago discovery that the catalogs don't list . The letter that I have explains it . Plan to make a separate page in my album for it . What intrigues me, is how you managed to get an image without the little arrows moving? Obviously not on a scanner platen. How did you do it? Although new to forum, not a stamp expert. The letter shown does not say "Boy Scout " but references "Scout ". Do you have specific information that identifies the stamps as Bou Scout? The trefoil on the stamp is typical of the Girl Guides (British origin) and used by Girl Scout organizations around the world. For accuracy, it appears the stamp may have been intended to be universal? Welcome Scout guy to this forum . You are right . But you need to view this stamp as part of a much large set ,both regular stamps and airmail stamps that were issued to celebrate the 50th anniversary of the Lebanese Boy Scouts. Thanks for your posting . Scout guy ---In hindsight 60 years later after that set was issued by Lebanon maybe mixing Boy and girl Scout symbols together on that set ,who knew of the changes that are happening to both organizations in 2018 . Floortrader, thank you the welcome. I did a bit more research. What I found is the Lebanon Boy Scout Program has used several different designs. Primarily they used either a flurdelee or a Cedar of Lebanon tree. 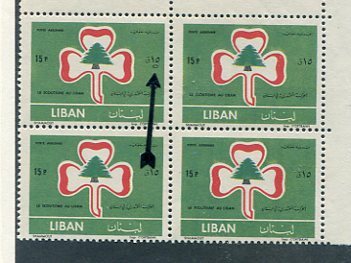 My personal conclusion is the the stamp is reference to F�d�ration Libanaise des Eclaireuses et des Guides. The current information does not show old designs but I do have the historical designs of the Lebanon Boy Scouts and the trefoil does not match. I do have a deeper knowledge on scouting questions than stamps in general. As a footnote, The BSA Program now excepts girls at all levels. It does not mean BSA and GSA are merging. They are not. The BSA action brings them into alignment with Scout Programs around the world. I believe there are countries where the boy and girl programs have merged. I am not aware which countries. Thanks for the additional info . and update on the Scout situation . Whatever that mark is it is not an Arabic zero unless somehow it was intentionally placed sideways and why would it not be next to its fellow numerals. It seems more like something went awry in the printing process. 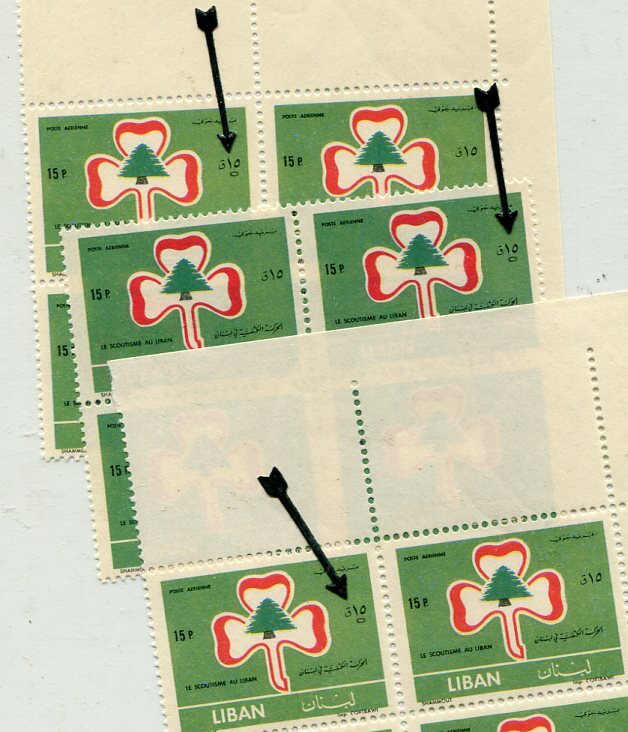 The Stanley Gibbons catalogue describes the set as Lebanese Scout Movement Commemorative (no mention of Boy), and lists the 15 p stamp as Cedar and Guide badge. Perhaps there is an error in the OP's heading. Perhaps not , Scott catalog calls it Boy Scout issue . About the error I'll go with the way it is written in the letter and place that in my album and move on to something else . It took 1.1 seconds to lick this stamp.